Six people were killed and 19 others injured after a crane part fell onto a ship under construction on Monday, local authorities said. 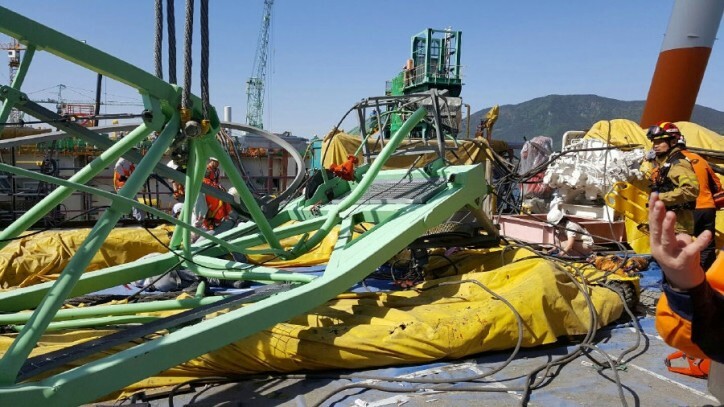 Two cranes collided at a Samsung Heavy Industries shipyard in the southeastern port city of Geoje around 2:50 p.m.LT, causing a structure to fall from one of the cranes, according to firefighters and police. The tower crane that broke was between 50 and 60 meters long and weighed 32 tons. Six were confirmed dead, three were seriously hurt, while 19 sustained minor injuries, police said. The injured were rushed to three nearby hospitals. Work has been underway to rescue others who may be buried at the site. "We haven't had such a big accident in the past several years," said a company official who spoke on the condition of anonymity. "For now, handling the accident is the most important. Please wait for official comments from the company." The stricken workers were finishing the ocean platform to be delivered to France next month when the accident took place. Samsung Heavy was building it upon a US$500 million order from a French company in December 2012. The police said they will look into whether the security regulations were complied with in the construction site and if there were any operational mistakes on the part of crane drivers or security supervisors.